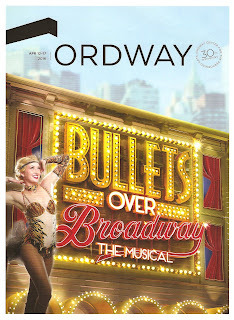 I didn't have high expectations for Bullets over Broadway, the 2014 Broadway musical based on the 1994 Woody Allen film now playing at St. Paul's Ordway Center, because it's: a) a movie adaptation, b) a jukebox musical, and c) written by Woody Allen (who has one of his characters say, "The artist can be forgiven anything if he produces great art." Um, no). None of these are my favorite things. But low expectations often leads to a better experience, as it did here. While definitely not "great art," Bullets over Broadway features some fantastic choreography, great performances by the talented ensemble (although they're a little too white than what is acceptable in a post-Hamilton world), and period songs that are well chosen and for the most part sound like they were written for the story. Woody Allen wrote the book based on his movie, and Glen Kelly adapted the music and wrote additional lyrics that help the songs from the 1920s (mostly unknown to me) flow more easily into the story. The gist of it is this: a struggling playwright named David accepts money from a gangster to get his play produced, but he must cast the gangster's no-talent girlfriend Olive in the play. The gangster's goon Cheech is supposed to look after Olive, and it turns out he has a knack for playwriting. He offers David a few suggestions, and soon he's re-written the whole play. David is racked with guilt because the play's star Helen, an "aging diva," falls in love with him because of the play he wrote that he didn't really write. Everything falls apart at the Broadway premiere, a few people end up dead, but it's still a happy ending because David learns his lesson and ends up with the girl he's supposed to. The plot allows for some fun in-jokes about theater and show business, but most of the characters are fairly one-note caricatures of types. So don't look for any depth here. The good news is the cast fully commits to these caricatures and manages to make them entertaining for the most part. Michael Williams is a charmer as the playwright David, performing with great physicality and energy. Jemma Jane has the look, voice, and mannerisms of a typical gangster's moll down pat. Jeff Brooks turns the murderous gangster Cheech into a character you love despite his crimes - I'm not sure if we're supposed to root for him, but I definitely did. As the actor who eats his way through the play production process, Bradley Allan Zarr is a scene stealer, nimble despite the continually growing padding. Despite being way too young for the role, Minnesota girl Emma Stratton has a lovely rich voice and commits fully to the stereotypical "aging diva," almost making you believe she is that fading star instead of a rising one. Come to think of it, in Woody Allen's world early 20s probably does qualify as "aging," but do we really need to take another role away from a woman over 40? 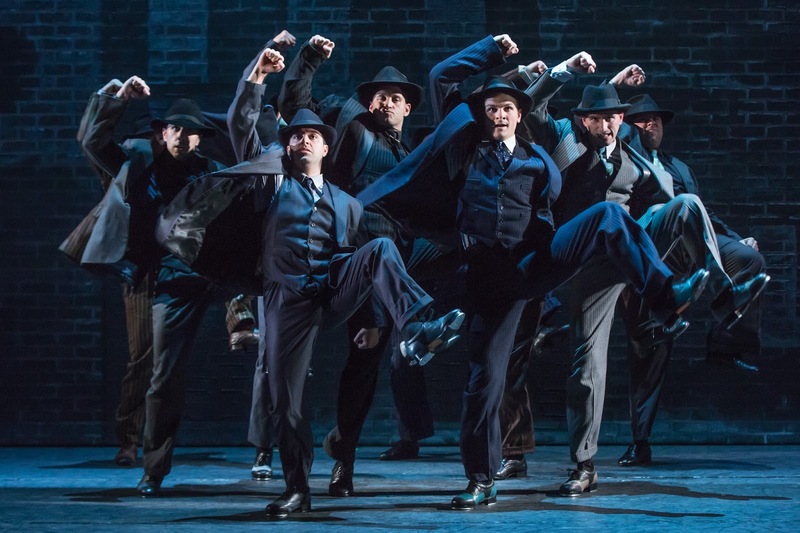 who doesn't love tap-dancing gangsters? 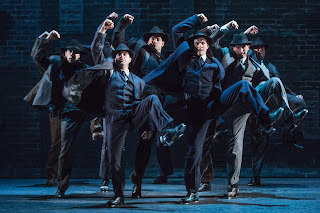 The best part of this show is Susan Stroman's choreography (she also directs), which is fun and fantastic and features a tap-dancing gangster number. The top-notch ensemble beautifully executes the choreography, and sounds great too, as does the pit orchestra. The second best part of this show are Tony Award-winning costume designer William Ivey Long's costumes, which are stunning and range from flapper dresses to pin-striped suits. If you're looking for a pleasantly entertaining old-fashioned musical that's high on spectacle and low on substance (and you're willing to overlook Woody Allen's alleged crimes), you might want to check out Bullets over Broadway before it leaves town after this Sunday's matinee. If that's not your cup of tea, may I also suggest Theater Latte Da's exquisite locally created new musical C., or Nautiulus Music-Theater's simply lovely reinvention of the classic The Fantasticks, or on the non-musical front the charming and hilarious local production of the Off-Broadway hit Buyer and Cellar, or New Epic Theater's epic pairing of The Normal Heart and Coriolanus in rep.